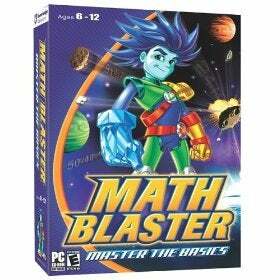 Classic edutainment franchise Math Blaster is making its way to the DS this fall thanks to a publishing deal with Majesco Entertainment. Math Blaster in the Prime Adventure combines adventure gaming with mathematical puzzles that has you fighting off an army of robots... robots with math skillz. The game will put your addition, subtraction and multiplication skills to the test and includes four player battle mode and challenge and adventure modes. I applaud this, seriously. Just the other day, while attending a dinner with Ken Levine and some other folks during PAX, I got into a discussion with a group of them about educational games for next gen consoles. I think that the three platform owners should get behind bringing a few educational games to their various downloadable game systems. They should do this for two reasons.If you can load a few of these games, games like Reader Rabbit or Math Blaster, on your console you can convince schools that perhaps they're worthy learning devices. Don't laugh. The fact is that most schools currently use those games to train kids on computers. Tristan has Computer Lab one week a month at his school. For second graders, computer lab means getting on a computer and playing educational games. The local library has these same games set up on their public computers. So they're OK with the notion that gaming can be educational. Now look at what Apple did in the 80s, donating computers to schools across the country (or selling them at absurdly low prices). Sure it was good for their image, but more importantly it won over a whole generation of computer users. The same could be true for console gamers. If you hook a 5-year-old, and more importantly their parents, on the Wii or the PS3 or the 360, then you've got them for life. Or at least a better chance of that, I think. You also can't overlook the fact that these are three huge corporate entities making, at least in one case, obscene amounts of money off of the games they sell. Why does the notion of being a good corporate citizen in this industry always have to step outside the arena where these companies make their money? Why not give back to gamers in a way that we can all appreciate? Take a loss on a few educational games and watch as older, parent gamers glom onto the consoles that take that first step. I can't tell you how many times I have parents ask me which system they should buy for their kids, which one has the opportunity not just to entertain, but educate. I can't tell you how many hours I've spent looking for those few and far between educational games for this generation of consoles.